I’m not on an animal testing rant today – I promise! I had moved onto working on something else after the last post and found this completely by accident. I was just so surprised by it that I had to share. 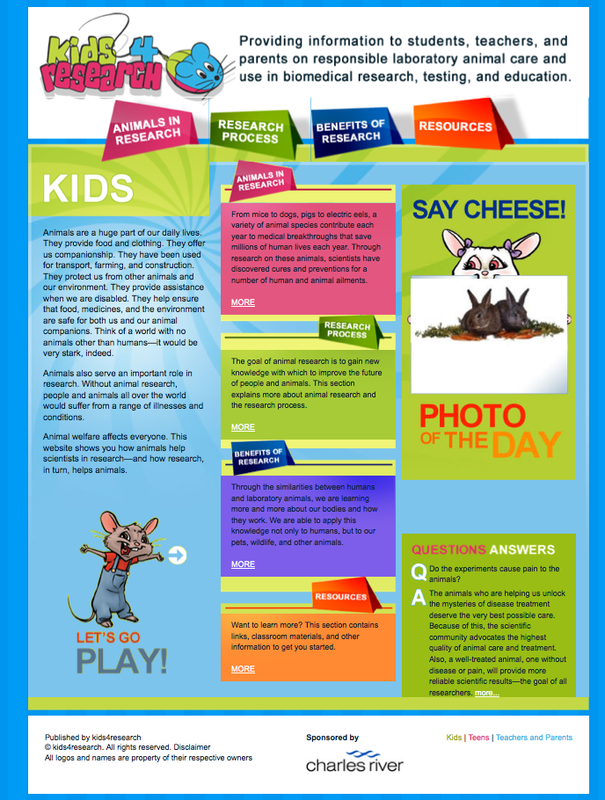 ‘Kids4Research‘ – an information site for kids, teachers and parents on animal testing. Really?? Not too surprisingly ‘sponsored’ (i.e. probably either commission or managed) by a research company. The ‘Photo of the day’ with its cute bunnies is an interesting touch – wondering if I could suggest the below for a ‘video of the day’ section. WARNING – THE BELOW VIDEO IS PRETTY GRAPHIC – IT IS NOT EASY TO WATCH! I realise that this video is put together by PETA and they are trying to get a message across – so is obviously only showing the extreme side of animal testing – but it does serve to bring back some reality to the opposite extreme of the ‘happy bunnies’ displayed on the Kids4Research site. Oh, and a message to Charles River – thanks for your resources, but I won’t be using them to show how wonderful animal testing is to my five year old.